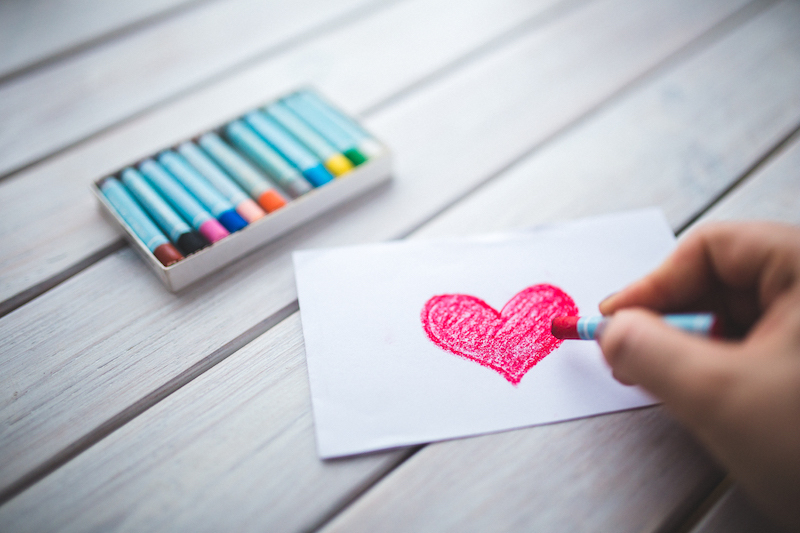 Throughout Mourning Hope’s group sessions, activities often involve some level of artistic expression because children typically do not have the words or the developmental abilities to express their emotions. One project completed during Mourning Hope’s weekend-long camp for grieving youth was a group graffiti board with the tag line: “If I could tell you one last thing...” The children spent a great deal of time determining what they would say if they had one more conversation with their mother, father, sibling, grandparent or friend who died. 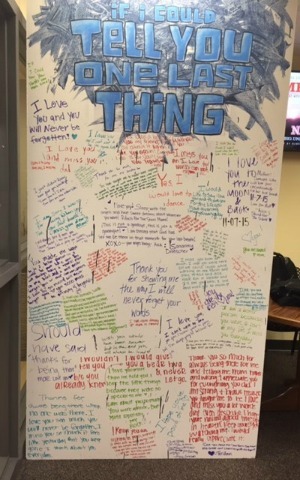 Under the guidance of Lincoln Public Schools art instructor, Adam Schwaninger, they very carefully crafted their words and images onto the group board to honor and remember their loved one. Words such as “I love you,” I’m sorry,” “I miss you” and “Goodbye” burst off the canvas in a vivid spectrum of color. Once finished, the board provided a visual representation of each child’s heartache, and served as a reminder that all children are connected in their grief. 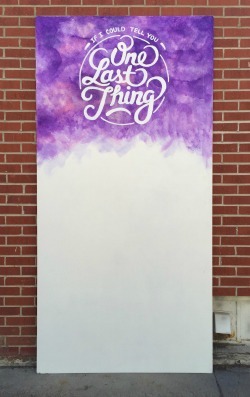 To connect with this project on social media, tell us #OneLastThing you would say to your loved one. Adam is an artist and art teacher in Lincoln. He received his BFA at Nebraska Wesleyan University and works and teaches in many mediums but specializes in graphite portraits. 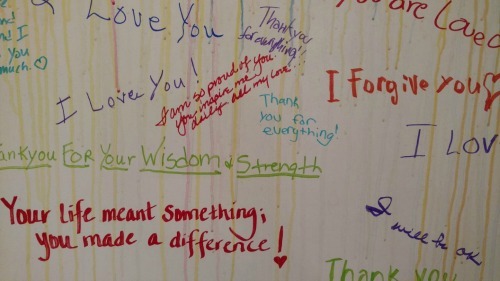 Adam created the original graffiti board for Camp Erin, where children “tagged" a message to a loved one who had died. Ben Swift is an artist and designer from Nebraska. He got his BFA at UNL and works in multiple mediums, including painting and screen-printing. He's happy to contribute to this Mourning Hope arts program. Peter Worth is an artist and designer who was raised and educated in the great state of Nebraska. He enjoys combining words with images through collage and screen printing. His artistic influences include Tom Sachs, James Rosenquist and Ed Ruscha. He dislikes mayonnaise, littering and crusty erasers that leave pink streaks on your paper. Ryan Holt is an artist/designer/maker living in Lincoln, Nebraska. He prides himself as a cultivator of mediocre ideas and bad dad jokes. Ryan’s graffiti-influenced style mixed with chaos and lack of organization made for a good fit for this project. Often needing a good reason to make the time for art—Mourning Hope is a better reason than most. Matt Anderson is a designer who was born and raised in the big city of Lincoln. Where he splits his time being an ‘old man’ and a 'twelve year old' (who is actually 25). He lives by the phrase 'Keep it simple stupid’, and enjoys watching people with the ability to create amazing art with simple things. He is happy to be able to help such a great cause. Emily Yoble is an artist and designer who was born and raised in Nebraska. She received her BFA at UNL and explores her passion for illustration and hand drawn typography through many different mediums including painting, pastels and screen printing. She is honored to contribute to this project for Mourning Hope. Daniel Dunbar is a designer born and raised in Nebraska. He got his BFA at UNK where he found his love for modern art and a nice long run every now and then. Daniel appreciates every opportunity he has to work with Mourning Hope.